A ‘piquant’ letter, indeed. Frosty is what I’d call it. Presumably the local worthies organising the campaign thought they could count on Bennett’s support because a) he was the man who put Stoke on the cultural map and b) he was a playwright whose hits included Milestones and The Title. Surely he was the ideal figure to lead a campaign? Partly Bennett’s response is the practical literary businessman in him talking. Theatres, like novelists, should make money by serving an audience. If there’s no audience, there’s little point to them. His theatrical novel, The Regent, shows him more excited by the thrills of running a theatre than by what appears on stage. I’m not sure how seriously he took the stage; the plays of his that I have read seem less fully-developed than his novels. When told that the Royal, Hanley, might become a place where such magic might happen, Bennett would not perhaps have thought it a tragedy. The theatre had more status, but films brought wonder into the lives of ordinary people. Bennett himself made several forays into film, the most successful of which was his script for Piccadilly (1929). Which reminds me that John Shapcott’s latest addition to the Bennett collection he is publishing will be Bennett’s novelised version of the film. It will be launched at the Stoke Film Theatre on 10 May, followed by a showing of the film with live piano accompaniment. I wish I could be there. 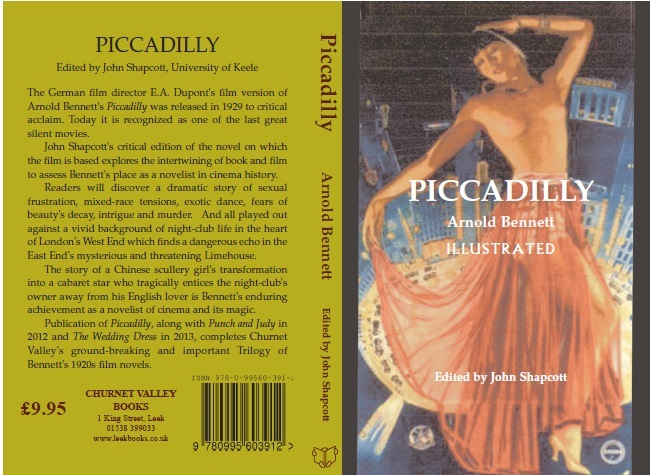 This entry was written by George Simmers and posted on April 29, 2017 at 2:19 pm and filed under Film, novels, Theatre with tags Arnold Bennett, Hanley, Piccadilly, theatres. Bookmark the permalink. Follow any comments here with the RSS feed for this post. Post a comment or leave a trackback: Trackback URL. Avery welcome addition. The novelisation was only ever published in a cheap edition on newsprint paper. A further fascinating insight into Bennett’s practical sense. But his response might have contributed to the Potteries general lack of warmth towards the son who put the city on the literary and cultural map. Yes. Bennett knew he owed a lot to the Potteries, and his affection for the people there shines through his work, even when he is most critical of the place, but he by and large did not sentimentalize the city – and maybe he thought clinging to an art form that had outlived its audience was sentimental.